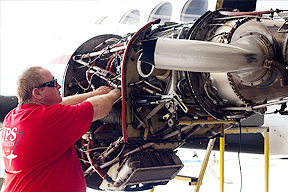 From light, single-engine planes to corporate turbine aircraft and from regular maintenance to major overhauls and inspections, JPS Aviation offers you the experience and expertise of factory-trained, certified mechanics to perform all the maintenance you need for your aircraft. We are an FAA-certified repair station with a computerized parts department that is online with each major manufacturer and parts supplier to provide you with the best possible service. Our maintenance facility has a certificate issued by the (FAA) under Title 14 of the Code of Federal Regulations Part 145 and performs maintenance, preventive maintenance, inspection, and alteration of aircraft and aircraft products. Every aspect of our work is inspected and recorded according to FAA regulations, before we return the aircraft to service. 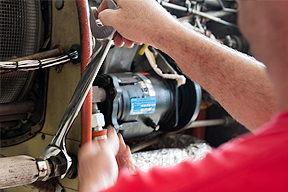 We take pride in knowing that all of our mechanics are factory-trained and certified, so all of our work performed will can be expected at FAA and factory standards. Our parts department is complete and computerized, and we even offer a complete maintenance tracking system that is also available. Contact us today or call (318) 387-0236 for all maintenance related inquiries.